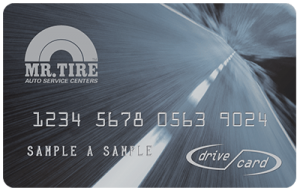 The Drive Card is a fast, convenient way to make your tire and service purchases. Get six months promotional financing* on any brand tires or service. Subject to credit approval. Apply for the Drive Card at any store. Terms and conditions apply. $250 minimum purchase required. *With credit approval for qualifying purchases made on the Drive Card at participating stores. As of December 26, 2018, APR for purchases 30.74%. Minimum interest charge $2.00. See card agreement for details. Offer valid for consumer accounts in good standing; is subject to change without notice; see store for details. May not be combined with any other credit promotion offer.